Welcome to the website of Dr Jacqueline Riding, art historian, historian, adviser and author. Jacqueline specialises in British history and art of the long eighteenth century. She is an experienced adviser and consultant for museums, historic buildings and film. She was the historical and art historical consultant for Mike Leigh’s award-winning feature film Mr. Turner (2014) and his new film Peterloo (in cinemas now). Her tie-in book Peterloo: The Story of the Manchester Massacre (Head of Zeus) is out and can be ordered here and she is now working on a biography of William Hogarth for Profile Books. She also advised on Wash Westmorland’s Colette Number 9 Films starring Kiera Knightly and Dominic West, and William McGregor’s Victorian folk tale Gwen Endor starring Eleanor Worthington-Cox and Maxine Peake. ‘A superb account of one of the defining moments in modern British history.’ Tristram Hunt. 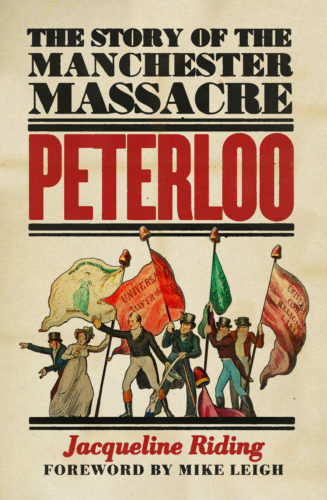 ‘Peterloo is one of the greatest scandals of British political history … Jacqueline Riding tells this tragic story with mesmerising skill.’ Professor John Bew, author of Citizen Clem. ‘Fast-paced and full of fascinating detail.’ Tim Clayton, author of Waterloo. In 2019 Jacqueline will be appearing at the Chipping Camden Literature Festival, the Historical Fiction Conference at the People’s History Museum (Manchester), the Derby Book Festival, the Wimpole History Festival, the Bradford Literature Festival, the Buxton International Festival and Manchester Histories Festival Peterloo 2019. Full details will be posted soon. Her book, drawing on her PhD thesis, Basic Instincts: Love, Passion and Violence in the Art of Joseph Highmore (Paul Holberton Publishing), was published to accompany the exhibition at the Foundling Museum (29 Sept 2017 – 7 Jan 2018). It can be ordered here. “[Basic Instincts] brings Joseph Highmore out of the shadows.” – Apollo Magazine. Read more reviews for Basic Instincts here.